Nairobi — Tourism Cabinet Secretary Najib Balala is on Tuesday scheduled to appear before the National Assembly Environment and Natural Resources Committee to answer queries on the deaths of 10 black rhinos. The committee dispatched the invite to Balala who has been largely blamed for overseeing the botched translocation of the rhinos that died on arrival in the Tsavo National Park, in one of the worst disasters in the sector. Balala has told off critics calling for his resignation and even suggested that "they can as well go to hell" because they are not the appointing authority. "Nobody has appointed me. It is only President Uhuru Kenyatta who has appointed me. So, they can go to hell. I can tell them that... Uhuru Kenyatta is the only one who has appointed me here and he knows I have the capacity to run the wildlife docket. Nobody is going to intimidate me," he said on Monday. The CS has already suspended six Kenya Wildlife Service officials over what he described as negligence on their part, even as experts in the conservation industry demand tough action against the Cabinet Secretary, saying he should take responsibility. Among those suspended include the service's Deputy Director in-charge of Biodiversity, Research and Monitoring, Samuel Kasiki, who according to a report tabled by a six-member probe team failed to coordinate research-line departments at the Kenya Wildlife Service leading to poor decision-making. 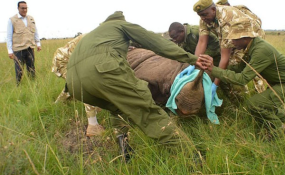 The Kenya Veterinary Association has faulted Balala for the suspensions saying that the officers were not directly linked to the rhino translocation process.